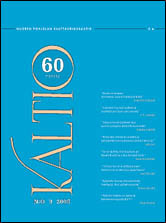 The cultural magazine Kaltio from Oulu in the Northern Finland - or Central, as we see it - is the only independently published Finnish magazine outside the Helsinki area to have been issued regularly for over 60 years. The 60th Anniversary celebrations took place on April 20th, 2005. European-ness, to the magazine, means also Northern Finnishness, Samishness, Barents area multiculturality. Arriving from a place roughly one hundred miles below the Arctic Circle, Kaltio adds a peripheral voice (or, more provokingly, noise) to the chorus of global cultural debate. For Kaltio, 'culture' signifies not only that section of human activity which comes usually with a tag 'Art' attached to its forehead, but rather all and any enterprise our dear humanity engages in. Thus in a cultural magazine we can - nay, must - write about ski-hunting bear, melting of the polar ice caps, witches, children's rhymeplay clubs, reindeer economy, text messages, peace movement, nuclear armament... and, of course, also all that we talk about when we talk about 'Art'. Being a small magazine with not much resources, we can only offer a small slice of our output in translation to our non-Finnish readers' delight. On the right, blue-shaded, You can see a list of articles, each headed with the issue number where it has been originally published. The archives (in Finnish) which include more articles from the magazine and the full contents pages can be reached by pressing HERE. The articles have been translated by Anniina Vuori with the supervision of Paavo J. Heinonen. The history of Kaltio, as far as we know, is not available in English. A very brief version, however, is available - click the link on the right or just press HERE. We are open to any suggestions on the contents of the site. Any comments or criticism should be sent to the address toimitus(a)kaltio.fi (just replace the (a) with a @). More contact information can be found on a personnel page HERE. KALTIO 4/2004: Wolfgang Becker, Goodbye Lenin! KALTIO 4/2004: Marlen Khutsiev (Khutsiyev) - Freedom, Love and Soviet Union. I Am Twenty. 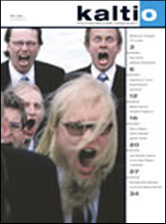 KALTIO 2/2004: Kristian Smeds - Without Compromising! KALTIO 6/2003: Marcos López - Password!